The SuperDuct SD Series duct detectors offers the convenience of modular design plus the power of advanced sensing technology. Available in a two wire version or a four wire version with separate controllers able to serve two detectors, installers have the freedom to configure the SuperDuct to suit the tight spaces typical of duct applications - and still have ready access to field connections and maintenance features. The SuperDuct's advanced circuit board-mounted photoelectric sensor is an integral part of the detector assembly and features environmental compensation that does away with sensitivity drift once and for all, ensuring unparalleled stability and reliability even under harsh environmental conditions. With its innovative remote test station, SuperDuct detectors can be tested for dirt contamination remotely, eliminating the need to physically access the detector with a sensitivity tester. This feature saves countless hours of fumbling with ladders and climbing into awkward spaces. The four wire version's snap-in RJ45 connectors reduce time spent on controller/detector interconnection to just a few seconds, while sampling tube spacing - and even field wiring connections - match standard configurations, making SuperDuct a drop-in alternative to bulky, outdated products on the market today. With a wide range of available accessories, SuperDuct provides a simple-to-install, easy-to-maintain, and highly-reliable solution for duct smoke detection needs. SuperDuct smoke detection is ideally suited to HVAC applications where early indication of combustion is required within the confined space of ventilation ductwork. Duct detectors are usually installed on the supply duct after the air filters, or in the return air stream prior to being diluted by outside air. To avoid the effects of stratification, install the sensor inlet tube a minimum of six duct widths beyond any bends in the duct. SuperDuct detectors continually sample air flow in the HVAC duct and initiate an alarm condition whenever smoke is detected. An alarm is activated when the quantity (percent obscuration) of combustion products in that air sample exceeds the detector's sensitivity setting. Air velocity in the duct as low as 100 ft/min. maintains adequate air flow into the sensor smoke chamber through air-holes in the air sampling tube and discharges through the exhaust tube. SuperDuct air sampling tubes must be installed with the inlet holes facing the airstream. Sampling tubes may be rotated in 45-degree increments so that air-holes can be aligned to allow the unit to be mounted in virtually any angle relative to the airflow. SuperDuct detectors are engineered to operate optimally under the harsh environmental conditions frequently found in HVAC ductwork. Nonetheless, before installing the detector, test the duct air velocity, temperature, and humidity to verify that it is within the operating range of the SuperDuct detector. Consult the SuperDuct installation sheet for details. With SuperDuct, smoke detection for two airstreams can be monitored with just one set of field connections for fan shut-down, damper control, etc. Up to two detectors may be connected to a single controller. Typically, the detector comes attached to the controller, connected by means of an integral cable (provided). Alternatively, one or both detectors may be installed remotely from the controller and connected by means of either a cable with RJ45 connectors, or terminal blocks (see ordering information for details). Wiring between detector and controller, along with wiring between controller and fire alarm panel (if used) is supervised. Controllers and detectors come pre-assembled for easy installation for the RJ45 models. They are sold separately for the terminal versions. These 8-conductor cables are used to interconnect detectors with controllers. Harnesses are availble in 5 ft., 10 ft., and 15 ft. lengths. They include RJ45 connectors with rubber glands to provide a watertight seal at each end. Rigid metal smapling tubes are available in several lengths. They can be installed without the need to open the detector. The Remote Test/Reset Station provides alarm test or dirty test capability from a remote location. 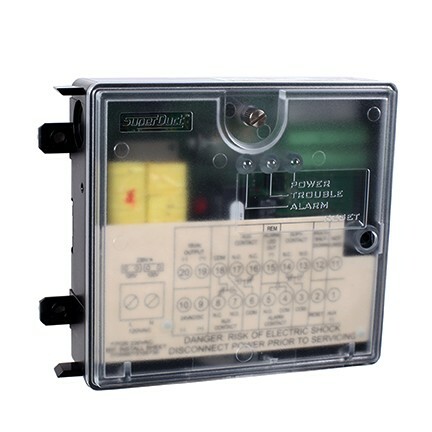 It includes a one-gang plate, momentary SPST switch, red alarm LED, and terminal block. Magnetically-operated or key-operated models are available. With this kit, and a suitable manometer, testing can be carried out with the duct detector fully installed and wired. Used to activate test routine from either a SD-TRM4 Remote Test/Reset Station, or the detector.